All contractors are invited to participate in an industry-wide activity that aims to seek and demonstrate the safety commitment of all levels in the construction industry, from top management staff down to frontline workers, on 27 May 2013. 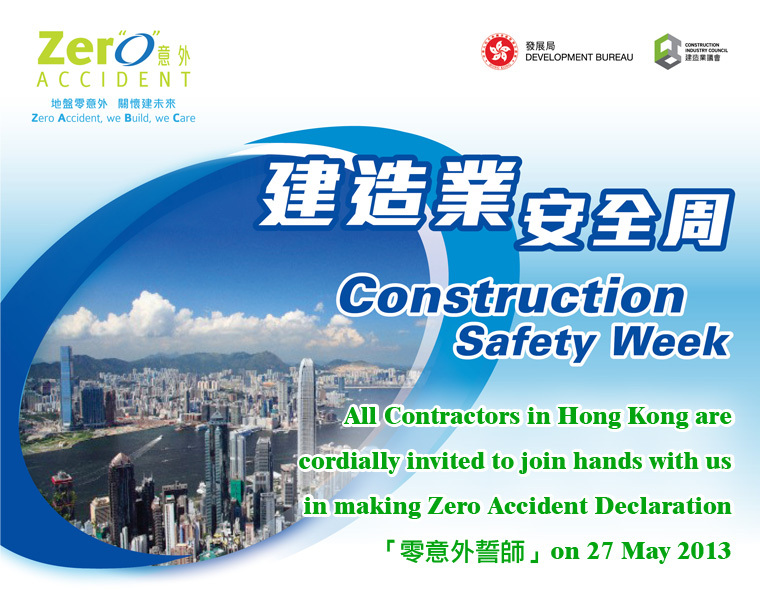 The activity is called “Zero Accident Declaration 「零意外誓師」”, which is jointly launched by the Development Bureau and the Construction Industry Council, and signifies the start of the Construction Safety Week 2013(CSW 2013) scheduled for 27 to 31 May 2013. We would like to call upon construction sites in Hong Kong to participate in the activity by conducting a morning assembly in each of their construction sites with all their site personnel and making a joint Zero Accident Declaration altogether, at 8:15 am on that day (i.e. 27 May 2013)1. Our objective is simple and clear: To let everyone in our construction industry to make and show their commitment towards achieving zero accident on construction sites. We appeal for all contractors' support to the Hong Kong’s biggest collective action on construction safety ever done in our construction industry. Apart from individual site, we will hold a “Zero Accident Declaration Ceremony” (the “Ceremony”) at the same time on 27 May 2013 at Kai Tak. At the Ceremony, the Chief Executive of the Hong Kong Special Administrative Region will lead a sizable group of construction workers, which will take the form of a morning assembly, to make the “Zero Accident Declaration”. We welcome nomination of workers to participate in the Ceremony. The Ceremony will be live webcasted for watching online at contractors' construction sites. At the same time, we would also arrange live webcasting of video images of the morning assembly and Zero Accident Declaration being conducted at other construction sites to the Kai Tak main venue, to show and demonstrate the collective actions by our constructions practitioners at the same time. To live webcast the video images of your sites to the Kai Tak main venue is simple; all you need is a webcam with broadband connection (more details of the technical requirements will be announced in due course). When Tropical Storm Warning Signal No. 3 (or above) or the Amber Rainstorm Warning Signal is hoisted or in force at or after 6:00 am on 27 May 2013, the above activities will be postponed to 30 May 2013.
whether contractors would like to live webcast the video images of the morning assembly and Zero Accident Declaration at your construction sites to Kai Tak (due to technical constraint, we can only allow 100 construction sites to live webcast their video images to Kai Tak; we will contact the selected sites on the detailed arrangements later). We look forward to hearing favourable response from all contractors soon! Contractors are encouraged to make use of the occasion to arrange other safety promotional activities after the Zero Accident Declaration, to demonstrate their safety leadership and reinforce the safety commitment of their site personnel.